In Atlanta, we live less than an hour from my parents, and it’s been an enormous blessing. I’ve known for a long time that my parents were special… unique. I haven’t witnessed too many family relationships that could navigate the tricky passage from a tiered parent-child dynamic into a more equal friendship; somehow my parents and I managed this transition. Maybe because I’m an only child, or because “respect” was the overriding theme of my upbringing, or perhaps we were just lucky, but I consider not just one, but each of my parents to be among my best friends and most trusted confidants. And though like any family we can drive each other a bit crazy, the distance between us while Raj, the kids and I travel has been tough on everyone. Before we left, we convinced my parents to plan on flying out to meet us halfway through; they were already mourning being away from the kids so long, so it gave everyone something to look forward to. It took about 10 minutes of discussion to determine that Banff was a place we all wanted to see and that we would likely be in that area approximately halfway through the trip. So, we planned a 9 nights, 3 leg trip in advance for which they would be staying with us. On day 45 of our trip, they flew into Calgary, rented a car and drove about 1.5 hours to meet up with us in Canmore, a cute little town about 20 minutes south of Banff. We only arrived in Canmore a couple hours before they did, and didn’t even get to finish our cleaning up and efforts to make things extra nice for them, but it was thrilling to see them pull up outside Gypsy. Only your family doesn’t mind if you are still grubby from traveling and cleaning, and things aren’t entirely ready for them as they enter their tiny little accommodations for their vacation! 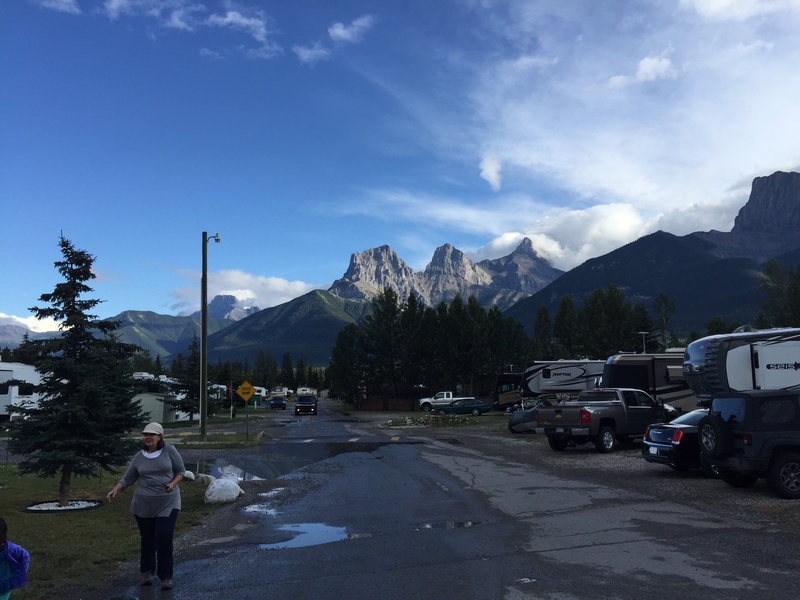 Though the RV park was rather disappointing, we all enjoyed the town of Canmore, and could even take a nature walk there. We found the town to be charming and surprising scenic. 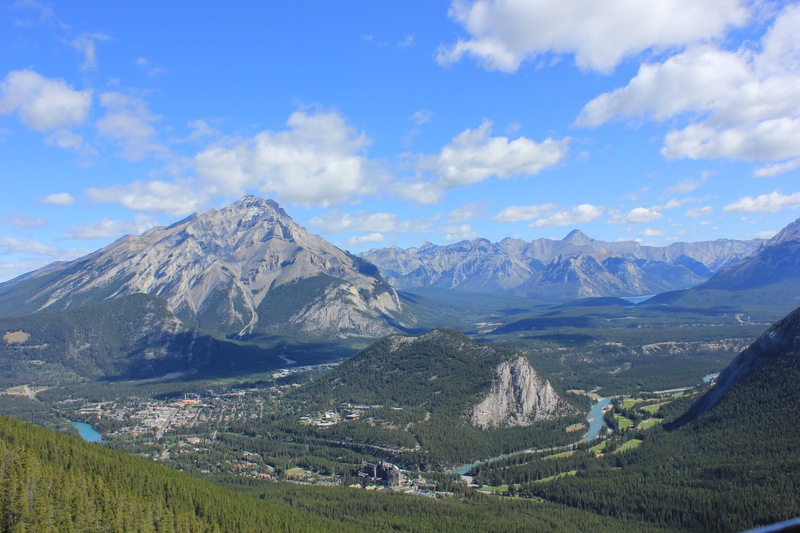 In fact, after touring Banff, we all agreed that Canmore is more beautiful, and entirely more enjoyable to Banff, which all found to annoyingly touristy and underwhelming. Lucky us that Banff accommodations had been booked up because after seeing Banff for an hour, and taking the obligatory (and insanely priced) gondola ride (you can take dogs too! ), we had no interest in returning, but truly enjoyed walking around, eating, and shopping in Canmore! I understand why it’s such a hotspot for retirees… if I couldn’t see my breath in July and could order a burger that wasn’t well done, I’d probably consider it too! 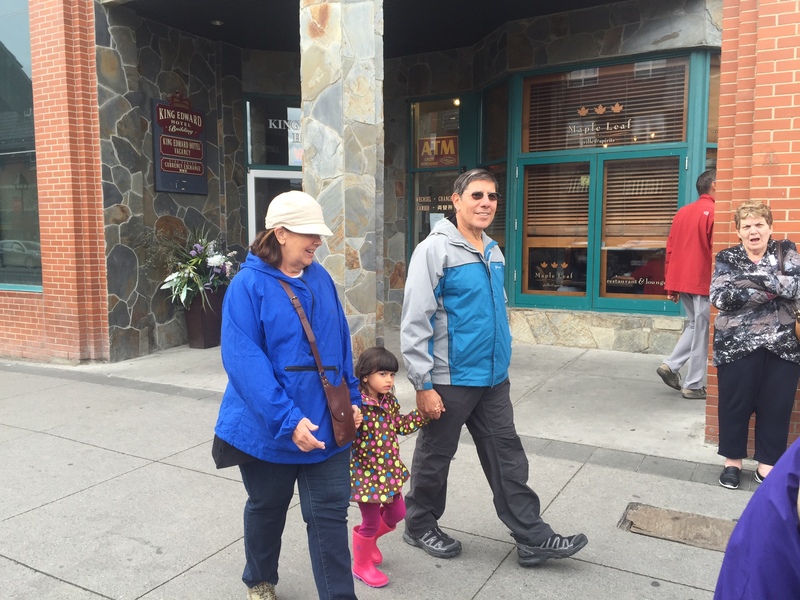 Mostly, the first leg in Canmore was devoted to doting grandparents loving on their beloved grandchildren. They not only brought way too many gifts, they taught the kids to fish in the creek, bought them ice cream at the school bus ice cream shop, read books, and spent hours at the playground. My amazing parents also let Raj and I get away for a much needed long lunch with several Bloody Caesars (btw, WHY do we drink Bloody Mary’s in the States… they are yummy, but Caesars are WAY better!!!). My mom and I cooked up several delicious meals too (and she even helped clean up after!) such as steak and salad, a shrimp/cauliflower/quinoa/kale creation, and sausages with asparagus and peppers. Lets be honest, we also drank quite a lot of wine and played an embarrassing amount of Bridge. Though I had been worried about how my parents would adjust to this type of camping, things were going well. Canmore Spring Creek Resort: maybe 3 stars, but only because of the stunning views and the lovely/convenient walkway along a stream into the cute town center of Canmore. Poorly designed layout with tough turns, mobile homes as your main view instead of the gorgeous peaks regardless of where in the camp they place you, useless wifi, sites way too close together, built in fire-pits too close to neighbor so you basically risk setting their rig on fire and can likely only get chairs around half of pit, and no grassy area to walk your dogs. Nice playground for kids though. Our second leg took us about 3 hours west into B.C. to a remote and mostly unknown resort on Kinbasket Lake. It was nice to have a leisurely morning as we packed up to leave Canmore – amazing how much easier it was with them watching the kids and dad pitching in with some of the outside packing up. We often commented and wondered what it must be like for seasoned, child-free campers… well, we now had confirmation that what generally takes us 2 hours, takes others 20 minutes. 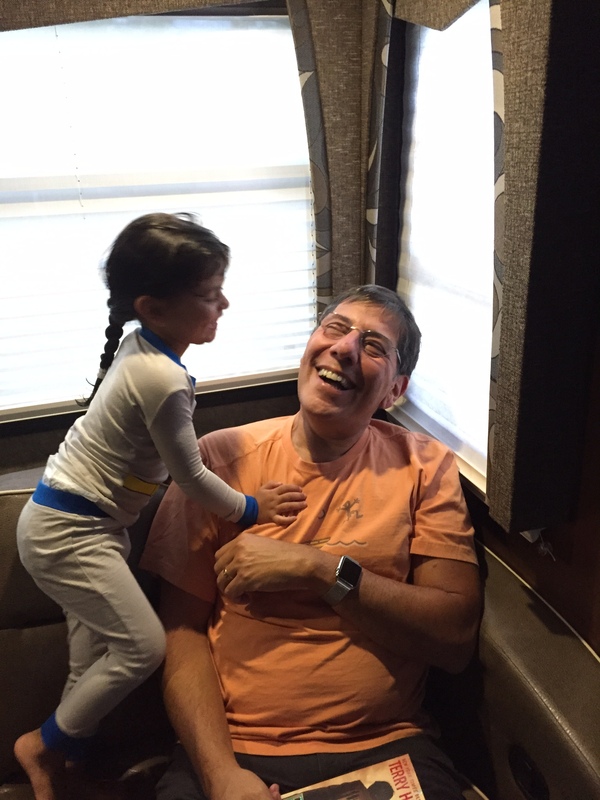 Oh, the joy of traveling with toddlers! But anyway, we were all happy to be going somewhere more remote for a few nights, and had read many reviews of the campground and it’s entry, but we were still taken aback by the unbelievable road down to the resort in Kinbasket. 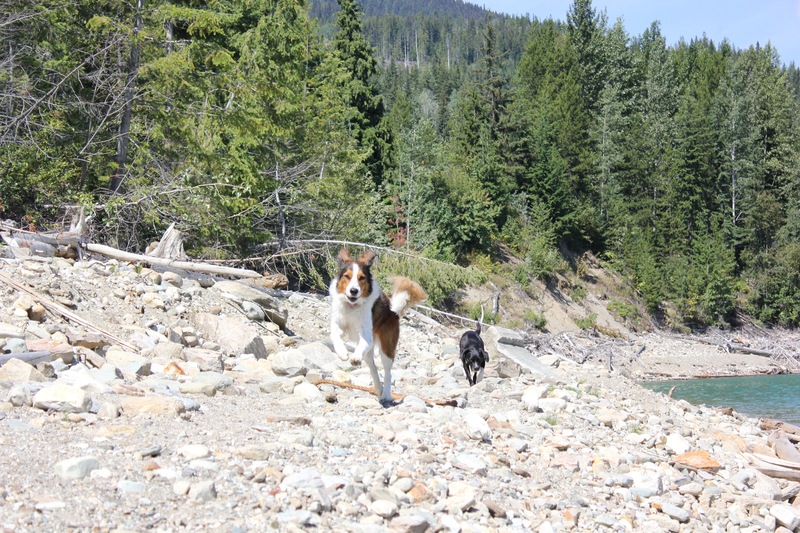 It took at least 10 minutes to work our way down a dirt, pothole filled, switchback happy, logging road, and over the train tracks… but when we did, the beautiful lake views were worth it! We pulled into our site the wrong way in order to maximize the views. It took a bit of work, but was worth it to see the lake right out our large front windows whenever inside, particularly first thing in the morning. We got incredibly lucky with clear, warm weather, especially since it rained up until about 20 minutes before we arrived! We only had 20 amp power for the first time (we need 50 to run everything, but 30 is sufficient as long as we don’t need both A/C units), no sewer, and generators weren’t allowed, so we had some adjusting to do (especially with 2 more adults with us), but the main thing we needed to get used to was the TRAINS! They weren’t a total surprise as the reviews mentioned them (actually, every. single. review mentioned them), but it was still a shock to realize just how close and how often the trains would rattle by. Raj and I are sound sleepers, but London and my mom struggled a bit in the night. London also needed loving arms securely around him during the day in order to enjoy the train without fear. The kids enjoyed lots of playground time with their Oma and Opa; the playground was fairly new but built to look rustic and blend into the scenery. At one point, we were all at the playground together, and a brief rainstorm blew through (our only rain while there). I looked off to the side and was struck with the sight of the most vibrant rainbow over the water! We all gasped and ran to the edge of the lake for a better view. None of us had ever seen anything quite like it. 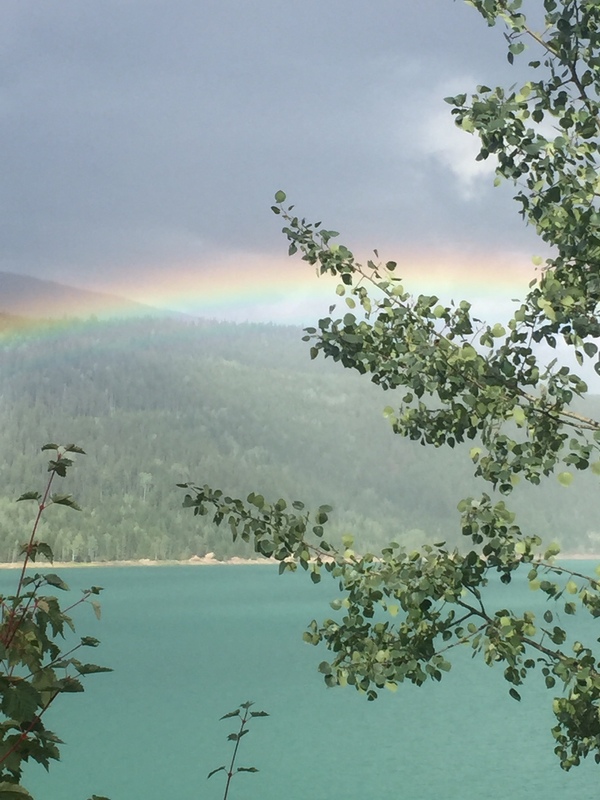 Since the passing of my paternal grandmother, we’ve believed rainbows to be a sign that she was with us, so as our family enjoyed the beautiful resort-like setting, it became even more special to be together. Our relaxing time was mostly filled with fishing and kayaking at the lake. My dad caught a few fish and I learned that I can actually cast pretty well (who knew?). I found fishing to be surprisingly meditative and peaceful; trying to fish with toddlers… not so much, but amusing. It was also great to finally get good use out of our two inflatable kayaks. The owner of the camp was cool with us leaving them down by the water, so once we spent 20-30 blowing them up, we were done until it was time to deflate them and pack them up. It was particularly nice to paddle out into the middle of the lake because from there we could see the glacier-capped peaks of Canada’s Glacier National Park. Raj and I celebrated our 10 year anniversary while at Kinbasket, and it was a beautiful and memorable day. We spent the morning with our family by the lake, gobbled an amazing Thai meal I created, and then Raj and I took off in the afternoon to explore Glacier National Park. After a quick trip to the visitor center, we chose to hike to Abbots Ridge, though we were getting a very late start for such an intense hike. The Park has lots of bear activity; so much so that by law you are required to hike with 4 or more persons on most of the trails. 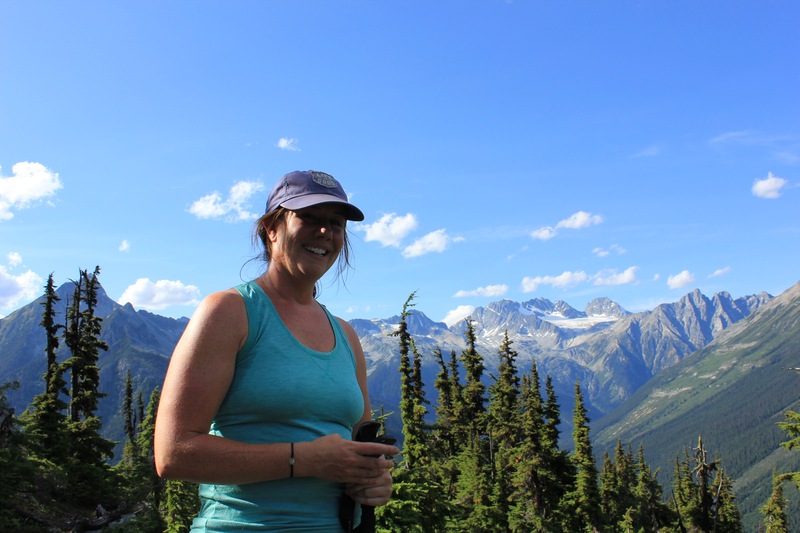 Luckily, Abbots Ridge was one of only 4 or so hikes where they didn’t have that requirement that day, but you better believe we had our bear spray and were constantly scanning for them! 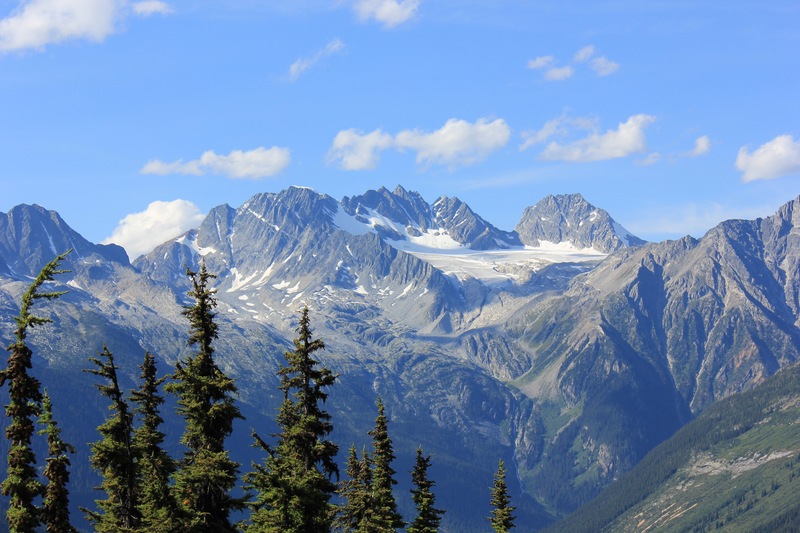 We chose this hike because it has the most stunning glacial views, and also because it was a more difficult hike that we could ever accomplish with the kids! Even without the kids, it was super tough! We climbed steep switchback through lush forest for the first half, and then it opened up to gorgeous views as we got above the tree-line. We kept on climbing and got to the ranger station in a large open meadow about 200 meters from the ridge. Here we took in the 360 degree majestic views and had our “Nature Valley” moment (or in our case, we each scarfed down a Larabar). We hadn’t stopped to rest our entire way up the 3000 or so feet, so it was nice to sit close to each other and catch our breath. At this point, I couldn’t have asked for anything else… it had been a perfect day in my book. But at that moment, Raj surprised me with a gorgeous diamond ring to mark our 10 years together! I choked down my frustration as we had promised each other NO GIFTS, and wondered how in the world he had managed to pull off such a surprise (fyi, my mom and Raj had been plotting for months and she actually had to bring it with her from Atlanta), then I put the ring away because I was scared to hike with it (though in retrospect it may have made a brilliant weapon had we encountered a bear – it could have blinded him!). Though we had hoped to make it to the summit, as the sun sank behind the ridge, we made the tough decision to not finish the last bit and to head back down so that we wouldn’t be stuck in the dark. Plus we were thirsty! I forgot to mention… about 30 minutes into the hike, Raj went to get a sip from our camel pack and found it EMPTY! I had just filled it up before we left, so the only conclusion we could fathom was that it had leaked out the mouthpiece when in the Jeep. To this day it’s a mystery – both how the water vanished, and how we managed that 5 hours without any water (and yes, we realize how irresponsible it was to do that). Overall, though my legs ached for days, it was an amazing way to spend our special day… 10 km for 10 years! Kinbasket: I read all the reviews of this place and knew it would be a love-it or hate-it type of place. Well, I LOVED it! Yes, the road down is intense, but bring your sense of adventure and go slow and you’ll make it just fine. (And side note: if you are the owner of a big rig towing a Wrangler, and you have the nerve to complain about this road, you do NOT deserve your Jeep – sell it someone who actually enjoys bumps in the road!) Yes, the train noise can be jarring at first, but you get used to it. We were in site 49, which was quite close to the train, yet if I returned, I would request site 52, which is the closest to the train, but has the most incredible views! However, if you are an incredibly light sleeper, or more importantly have trouble falling back asleep, I could see how the train aspect could make you miserable. Having said that, I’ve experienced worse train noise in Parks Canada Lake Louise park. 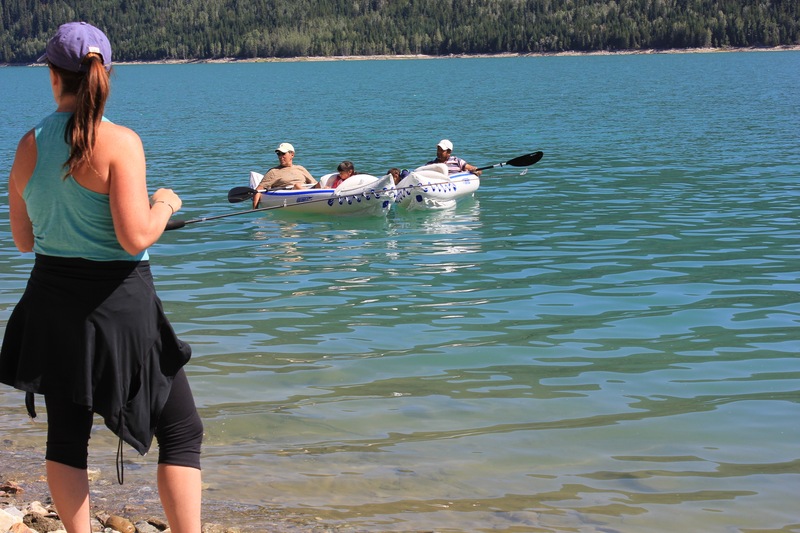 Overall, this place has it all: gorgeous lake views and access, fishing, boating (and lovely glacier park views from the lake), playground, clean facilities, and an owner who clearly cares about his business and comes around to meet his customers. I highly recommend this place, as long as your priority is connecting with nature and not having every comfort you are used to (read: over 20 amp, sewer, generator, and concrete). If you do choose to stay, venture back up the road at least once to check out Glacier National Park; it’s beautiful! For whatever reason, everyone was grumpy the day we left Kinbasket and drove back east to Lake Louise. We had hoped to all drive to the Columbia Icefields, but it was just too hard that day. We found Lake Louise to be a nightmare with the traffic and crowds! Though we expected the usual peak season traffic, we had a few other things working against us… 1) none of us particularly like crowds and touristy things, 2) we were there during a major Canadian holiday, and 3) Canada’s economy has been suffering and their dollar is weak against the US’s so there was way more domestic travel than usual. Whether it can be explained or not, it was ridiculous to the point of being miserable and after 6 nights in close quarters, with trains and babies waking us all in the night, the mood was… well, you can imagine. OH, and have I mentioned we were also dealing with the second RV problem since my parents arrived? Yeah, the first one started their first day when our grey tank wouldn’t empty. Raj and my dad had to take the whole sucker apart to try and figure out why it was clogged. 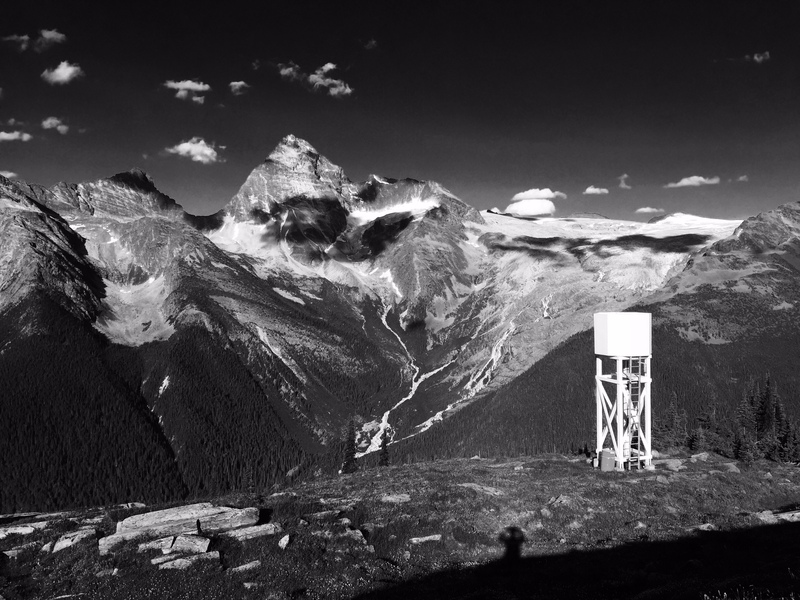 Then, as we got to Lake Louise, we had an issue with the fresh water tank siphoning out water. Since our campsite didn’t have water, by the time we would fill it at the station and drive to the site, it was only 1/3 or so full. Somebody tell me why water issues follow my parents! Not that I’m blaming them; they were actually very helpful and troopers about the whole thing, but a lack of water was a potential big problem because the plan while camping at Lake Louise was for Raj and I to go stay at the Fairmont for 2 nights and officially celebrate our anniversary while my parents stayed with the kids in Gypsy (have I mentioned yet that my parents are amazing?). 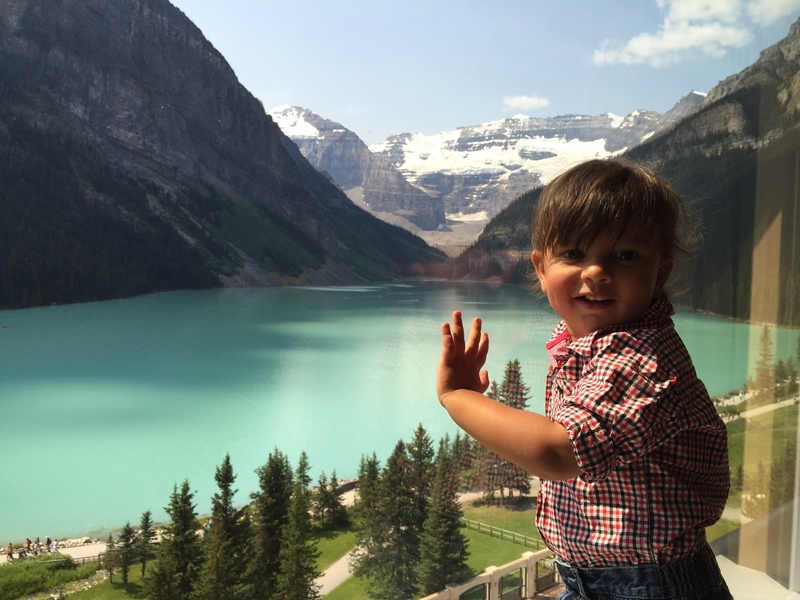 We started off our stay at the Fairmont Lake Louise with an upgrade to a suite on the Gold Level and then went to a decadent Afternoon Tea with my parents and the kids. My brave and determined parents sent us on our way to massages and took the kids back to camp despite the risk they would run out of water. We were only 10 minutes away, so could have helped if necessary, but we felt guilty they would have to cope with such an inconvenient stress as we enjoyed a ridiculous amount of luxury and pampering. And enjoy it we did! We ate poutine, had long showers and baths, ate a fun fondue dinner the first night and a fancy dinner the next night, we slept in and then ordered room service, ordered movies, and generally basked in the glory of doing whatever we wanted to do when we wanted to do it! What a fantastic treat! The highlight of our getaway for me was finally going horseback riding! It’s been so difficult to pass up so many opportunities in horse country because of the lack of childcare. 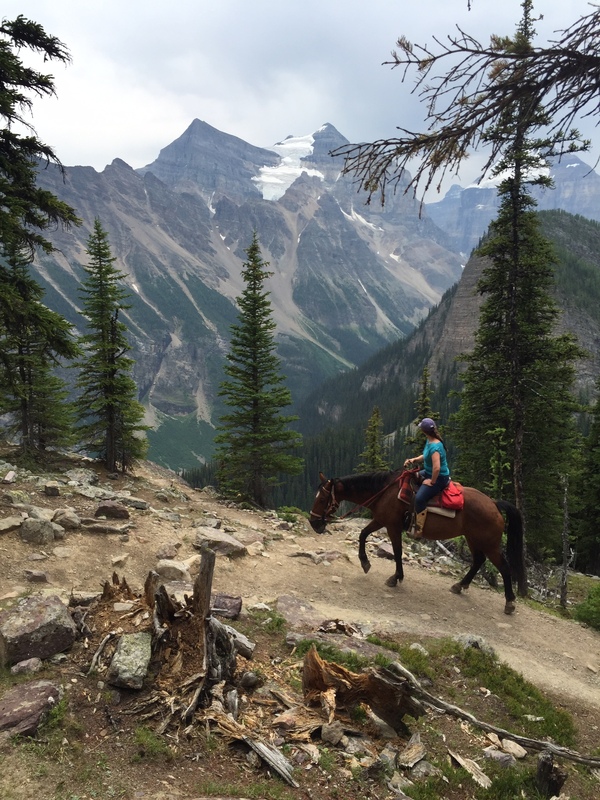 So we took a 3.5 hours trail ride to the Little Beehive and Teahouse through Timberline Tours, Lake Louise. They had nice horses and a small group for a surprisingly reasonable price. Since we got rained on on our way back to the stables and on our walk back to the hotel, Raj and I went to get coffee in the Gold lounge but that quickly turned into too many cocktails! Good thing I didn’t have to take care of kids that night! Unfortunately, as our decadent couple of days away ended, so did my parents’ visit. I couldn’t believe they were leaving already! They met us at the hotel to use our shower because they had indeed run out of water, and that offerered us the opportunity to have one last lovely lunch before checking out. It was emotional to say goodbye. No doubt their visit and inevitable departure triggered my before-mentioned homesickness. Even the weather reflected the gloom as storms moved through and drenched absolutely everything in our camp. It never stopped raining that night, so raj and I had to pack up everything in the rain and store it damp for the first time in 2 months! As a whole, it’s been hard to adjust to them being gone; not only do we miss them, and they us, but in many ways Raj and I have struggled to get back into the swing of things. Our routine was disrupted and we got a reminder for how easy life can be when you have help from loved ones and opportunity for a real break from the day-to-day. Luckily, as I write this, we’re finally beginning to find our groove again and have been enjoying more remote areas and more opportunities to spend time with and on horses. I can’t wait to tell you more! Parks Canada Lake Louise-Banff: 3.5 stars. campground basic but nice, heavily wooded so some wildlife and also mosquitoes. our site was electric only (30 amp). Nice walking trails. Trains SO loud. Bathrooms clean but showers were a hike.